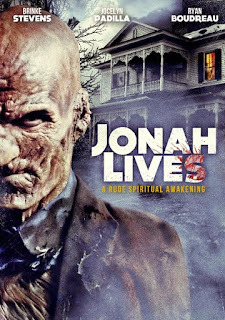 Wild Eye Releasing has announced the April 21st DVD release of film festival hit Jonah Lives. Hailed as "a fine cinematic debut" by Horrornews.net, Jonah Lives stars B-movie legend Brinke Stevens (Nightmare Sisters, Teenage Exorcist, Bad Girls from Mars) as a woman who thought she'd gotten away with murder, until some bored teens with a ouija board accidentally bring her buried secret back with a vengeance. The film was shot in Fall River, MA, the home of Lizzie Borden and site of the infamous Borden family murders that remain unsolved to this day. A group of suburban teenagers find themselves embroiled in a story of revenge from beyond the grave. Foolishly playing with a ouija board, they contact the spirit of a murdered man. Jonah rips his way out of the earth in the form of a murderous zombie, intent on avenging his untimely demise. Before he can rip out the heart of his killer, he must claim the lives of the teens that disturbed his rest. The DVD release of Jonah Lives will exclusively include a behind the scenes featurette with Brinke Stevens, a Fall River post-screening celebration featurette, teasers and trailers. I live for this type of film, it's a can you dig it film... yes you can dig it! !